What does a bad credit score tell people about you? For starters, it lets lenders know that you are a credit risk, and that you are financially unsound. But that is only the beginning. The correlation between credit scores and other risks in your life are substantial. You are apt to take more risky behavior, have frequent accidents, have more stress in your life, and have a lower life expectancy. People are gathering all this information about you based on a single number. Credit scores can cost (or save you) thousands of dollars in your lifetime, keep you out of your perfect job, and limit your ability to do the things you want in life. With everything that is riding on a credit score, it is imperative that you maintain a good score and repair a bad score. A credit score is a formula that calculates your credit risk based on your credit report at a specific point in time. Your credit report is your credit history and serves as a credit reference. There is more than one credit score out there. Auto insurance has their own score on which they base your premiums. This specialized score is still based on information in your credit report, but focuses on your auto claims history. Home insurance is another type of specialized credit score. This score will use information in your credit report but will also take into consideration your home and neighborhood selection to influence your premiums. The higher your score, the lower the premiums you will pay. You can see that a good credit score is already starting to save you money. The credit score that is the most well-known is your FICO credit score. This is a single number that ranges from 300 on the low end to a maximum of 850. You want to aim for a score above 760. This is considered an excellent credit rating and will earn you the lowest forms of interest in your loans. The difference between a score of 810 and 820 is negligible, but the difference between 750 and 760 can be great. There are five main factors that go into the making of a credit score. First, credit bureaus will look at your payment history. Payment history makes up 35% of your total score. This is the largest contributor to your credit score and what you want to focus on when maintaining or repairing your credit score. How often are you making late payments? The more late payments you make, the worse off your credit score will be. Try to make on-time payments, even if you are only making the minimum required payment. If you cannot make a payment this month, don’t just forget about it and catch it next month. Call up your loan company, explain your situation, and see if they can forgive your payment for the current month. There are a lot of companies that can freeze your payments for a month or two, so you can make the payment down the road. It only takes a phone call (and maybe a little crying) to make sure your payment history is unaffected. The next factor that determines your credit score is your total amount owed. This is the second largest factor and will make up 30% of your score. Loan companies don’t want to see a lot of credit utilization. The more credit you use, the more the loan companies fear your ability to pay back all the loans. Loan companies are going to look at your credit utilization rate. Stated simply, your utilization rate is how much of a balance you have on your credit compared to the total amount of credit that you have available. If you have one credit card that has a $10,000 limit and you currently have a $9,000 balance, then your credit utilization is 90%. If you open a new credit card with another $10,000 limit, your credit utilization will fall to 45%. Ideally, you want to keep your credit utilization at 30% or below. This lets the loan companies know that you are using some of your credit and making on-time payments, but you are not using most or all of your available credit. Don’t try to have a 0% credit utilization. Yes, you want to put things on your credit card and pay them off immediately. That is good, but don’t open a credit card and never put anything on it. That is bad. That doesn’t provide the credit card companies with information on how you handle your credit and payments. To lower your credit utilization, you can pay off your existing debt, increase your credit limit on that card, or open another card to increase your overall limit. The idea is to get your debt down and the available credit up. The next factor that goes into your credit score is the length of credit history. How old is your oldest account? 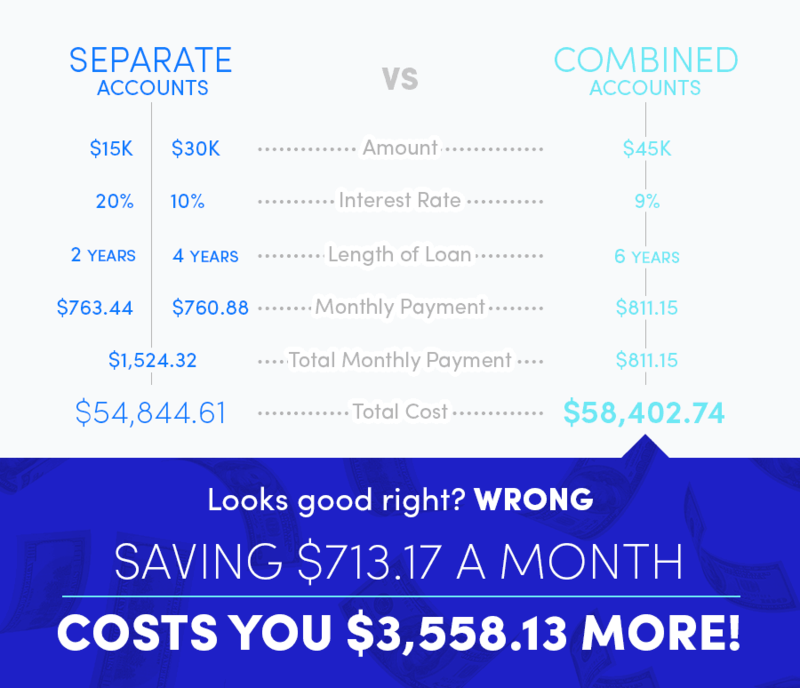 For a loan company, the longer you’ve properly managed your credit the better. It is better to keep your very old cards open than it is to close them. What happens if you never use that old card again? If the card doesn’t have an annual fee, then you should keep it open. It is always a good idea to put a reoccurring charge on that card and then have it autopay it off every month. If you have a gym membership or Netflix subscription, these are perfect for that card. If the bank or loan company sees that the card hasn’t been used in a long time, they may go ahead and close it for you to remove that risk from their books. If you are actively using the card, then it won’t get canceled automatically. If the old card that you have has an annual fee, speak with the bank about moving the card to a fee-less card. This can remove the fee but maintains your credit history and allows you to keep the same credit account, which is what you want to do. Your credit history isn’t a huge factor, as it accounts for only 15% of your total score. If you are not debating closing your oldest accounts then don’t worry. If you have accounts from 10 years ago, don’t debate closing an account that is 3 years old. Closing the 3 year account shouldn’t have a large effect on your credit score. The hit of closing a credit account doesn’t occur as a hit to credit history, but it does hurt your credit utilization. Using the example above, if you had a $20,000 credit limit and a $9,000 balance, your credit utilization would be 45%. If you decide to close a card that has a $10,000 limit, your credit utilization would rocket to 90%. Before you close a card, it is best to look at the overall impact of closing the account, meaning both your credit history and credit utilization. If your utilization is already low enough, you may be able to close the account without a ding to your score. If your utilization is not low enough, you may be able to raise the limits of your other cards to offset the loss in credit limit when you close the account. The next factor affecting your credit score is the addition of new credit. The weight of new credit on your score is 10%. When you shop for new credit, the inquiries companies make on your credit report can stay on your credit report for 2 years. Hard inquiries are not bad. But you want to avoid making a lot of hard inquiries in a short time span. This could signal to lenders that you are looking for a lot of credit at once, which sends out a red flag. In the past, each hard inquiry would show up on your report, which made shopping around for a better interest rate on a mortgage or loan painful. In recent years, they have changed the way hard inquiries are counted on your credit report. All inquiries for one credit type in a 45-day window are counted as one credit check. This allows you to shop around for the best interest rate and keep your credit score intact. If another inquiry occurs outside of that 45-day window, it will hit your report again. So if you are shopping for a new loan, try to make all inquiries within 45-days from when you start the process. A soft inquiry occurs when someone is simply checking your credit. These inquiries are not connected to an application of new credit. When you or your company is checking your credit, this is a soft inquiry. Soft inquiries do not affect your credit score. The remaining 10% of your credit score comes from the types of credit used. This is not a large factor for the determination of your credit score, but it does play a small role. A mix of credit types means you will probably have credit cards and some type of loan. Lenders want to see people successfully manage multiple types of credit. There are no secret tricks to use to magically improve your credit score. Improving your credit score takes time, but the payoff is worth it. What you want to avoid are companies advertising that they can improve your credit score quickly. This is extra money being thrown away at a scam company that could be better spent paying down debt. The good news is that the lower your score is, the easier it will be to improve. It is a lot harder to get a credit score to increase from 750 to 760 than it is to get one to increase from 600 to 700. The first step to fixing your credit is to know what your credit score is and how it got there. A lot of websites, including your bank or credit card lender, provide free ways to see your credit score. This is a good start. A credit score will only show you your credit number, not how you got to the number. You can use this to monitor your score periodically and make sure you are on the right track. If you see any red flags in the number, then you can pull the report to find out what is going on. If you cannot find your credit score, use websites like CapitalOne’s CreditWise or Credit Karma to monitor your score. CapitalOne’s CreditWise will also provide the added benefits of monitoring your social security number and scanning the dark-web for your personal information. Credit Karma can also tell you what your auto and home insurance scores are. To pull your credit report use AnnualCreditReport.com. This website was set up by the three reporting agencies, Equifax, Experian, and TransUnion, to offer you your free annual credit report. You are allowed one free credit report a year before you need to start paying for it. We recommend checking your credit report a minimum of once a year. Go ahead and put it on your calendar! If you are busy trying to fix your credit, you may want to pull your credit report a couple of times a year. Too many pulls wouldn’t be advantageous, because credit scores and reports don’t change quickly. When you are looking at your credit report, you need to make sure that everything that is on it is due to the actions you’ve taken. Random hard inquiries that show up without your permission should be disputed. Not only can they lower your score, but they can suggest identity theft. Identity theft is a serious issue that can damage your credit score and set you back. Identity thieves are not looking to open these credit cards and pay the bills on time. They will max out the cards, never pay the bills, and stick you with the damage. Looking for hard inquiries that you did not authorize will help minimize the impact of the theft by catching it early. Besides checking for hard inquiries, you need to check the rest of the information to ensure it is correct. Companies have a legal right to make sure that the information in your credit report is accurate and complete. If you spot incorrect information, you need to act quickly to make sure everything is corrected. The first step is to write the credit reporting company to let them know which information is inaccurate. Use this dispute letter to make them aware of the mistakes. Send them copies of the documents you have that support your position against the inaccurate information. Try to be extremely clear in your presentation of what is wrong on your report and why. Credit reporting companies cannot simply sit on this information; they must act within 30 days to correct the errors once they find them to be true. They will also send you the results, and a free credit report, detailing the changes that were made. You can also get the credit reporting company to send notices to anyone who has pulled your credit within the last six months. If you apply for a job or loan but were denied because of an error on your credit report, this can help you get that fixed. If you have negative information on your report that is accurate, only the passage of time will help those items roll off. A credit reporting company can keep negative information on your record for up to seven years, ten years if you filed bankruptcy. The second step to improving your credit score is being on time monthly payments. Payment history makes up 35% of your overall score, so it is a good idea to start there. Going forward, you want zero late payments. The late payments you’ve had in the past will begin to fall off and matter less. Credit companies understand that some payments may be made late, but if you improve going forward, that is great for your score. If possible, set up auto bill pay so you don’t miss a payment. Always make sure you are making at least the minimum payment for each loan. The next biggest factor affecting your credit score that we will attack to improve your score is credit utilization. The optimal level of credit utilization, as stated above, is around or below 30%. Maxing out your cards and carrying a lot of debt will negatively impact your score. Be careful not to open too many credit cards, such as retail store cards, that allow you to carry debt instead of just purchasing the goods outright. Those 0% interest cards may look nice, but the debt can quickly add up. Once you are making minimum monthly payments on all your loans, start paying down your debt. Make a list of all your credit cards, the balances, and the interest rates. Put your cards in order from the card with the least amount of debt on it to the card with the most amount of debt. Put any extra money you have towards the cards with the lowest amount of debt. As you start paying cards off, move that extra money to the next card with the lowest amount of debt. Your money will snowball to pay off your debt quickly. You will have fewer cards to make minimum monthly payments on, and less interest will be accruing so you can move more money to pay down cards with larger balances. Seeing yourself pay off credit cards will have a huge impact. The reason you don’t start with the higher interest or higher debt cards is that paying off the lower debt cards will offer you small wins. Those small wins will add to the motivation and momentum of paying down your debt. If you started a new diet, and next week you stepped on the scale and you were down 5 pounds, it would be easy to pass up that donut and continue to eat healthy. But, if you were to start a diet but you couldn’t step on the scale for a month, it would be difficult to feel motivated by your efforts. If you are carrying a lot of debt and have cards with annual fees, you need to downgrade those cards to remove the annual fees. The added perks and benefits of cards with fees are not helping you when you are paying 20% in interest plus an annual fee. Talk to your lender to get the card downgraded until your debt is cleared up. At that point, you can revisit adding cards with fees and perks. These are the two main areas on which you need to focus your efforts when trying to improve your credit score. Yes, credit history is another factor that influences your score, but there is little you to change this as you cannot go back to the past and open an account. Be mindful of the effect closing cards ill have on your credit history and your credit utilization. When looking at your credit report, you may notice some outstanding debt on your record that you haven’t paid off. The question then becomes, should you pay off your debt or should you let your debt fall off? This question should only come up if your current debt level is below the 30% mark. Old debt will affect your credit score, but not as much as current debt. Don’t worry about old payments if you are maxing out your current cards. Once your credit utilization is below 30%, you can then target your old outstanding debt. Old debt will fall off your credit report after seven years. There is also a statute of limitations on how long a debt company can sue you to collect on that debt. The statute of limitations varies by state and you can view your state’s statute of limitations below. Once a debt passes the statute of limitations, it becomes time-barred debt. Time-barred debt still needs to be paid, and can still be collected, but they cannot sue you for the debt. If you decide to make a partial payment, payment arrangement, or accept a settlement offer, you will restart the statute of limitations. This is fine if you intend to pay the debt down, but if you start a payment plan and don’t pay it, you are opening yourself up to a lawsuit. With a time-barred debt, you can request that the bill collectors cease to contact you by phone or through the mail. This doesn’t make the debt disappear, but it does help ease all the phone calls you will be getting during dinner. Just because a debt becomes time-barred or falls off your credit report, doesn’t mean the institution has forgotten about it. If you have an old debt with a bank, it will be difficult to open an account at that bank without first paying the debt. Even if a debt is time-barred, or falls off your credit report, you should still pay the debt off. If it is legitimately your debt, you should make every effort to pay the debt. It is the right thing to do. Are debt consolidation services really a “Get Out of Jail Free” card? A debt consolidation service will take all, or most, of your unsecured debt, collect it, and create a payment plan to pay off everything in one lump sum. They promise lower payments and lower interest rates. The truth is that they may be able to offer a lower interest rate. It is not hard to beat an interest rate on a credit card of 20%. The problem is that they can extend the term to pay off your loans. It is like buying a new car, deciding you can’t afford the payments for a 5-year loan, so you extend it to a 7-year loan. Yes, the payments will be cheaper, but you will carry the debt longer and pay more over time. If you have debt that can be paid off in a couple of months, consolidating it with other debt will extend that debt out. You need to take a hard look and run the numbers to see what the debt consolidator is offering versus what you have now. It may look better to have a lower monthly payment, but if you extend out your debt, you will be paying more in the long run. Unfortunately, trying to plan for every outcome that life throws at you can be tough and exhausting. With one surprise after another, you can find yourself getting behind in your finances and falling deeper into debt. You don’t know how it all started, how you got to where you are now, or how to get out of it. The best way to fix your credit moving forward is to create a plan of action. First, you need to get your spending under control. You need to take a hard look at where your money is going and if it is worth the stress of accumulating high-interest debt. Most likely, it is not. Once you have an idea of your spending habits, you can begin to reduce your spending and funnel that money towards paying off your debt. No level of credit repair will matter if you cannot get your spending under control and your debt paid down. Attack the debt with the smallest balances to get rid of them faster. These small wins will help drive the momentum and funds to tackle the bigger debt. There is no quick fix here. Systematically attacking debt is your only option to help repair your credit. After you have knocked down most of your debt, you need to start an emergency fund. An emergency fund should be held in cash, not invested, so it remains totally liquid. Now when life throws a surprise at you, you don’t have to charge it to a credit card, you have cash to get you out of a bind. Design a credit repair plan of tracking your spending, paying down debt, and building an emergency fund. Follow these steps and watch your credit score rebound, the debt collectors fall off, and save thousands of dollars on loans and insurance.